The 4th Japanese Film Festival will arrive in Dublin in November showcasing the best in Japanese cinema for Dublin audiences. The event expands this year as a result of a hugely popular event last year which showed the appetite in Dublin for Japanese cinema. The films screen at Cineworld, Parnell Street, on November 10th and 11th and in the Screen Cinema, D’Olier Street on November 12th and 13th. 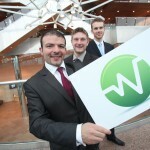 Wattics, the electricity management savings company, launched their money saving “Clever Metering” system which can save businesses thousands of euros. Wattics break-through technology helps customers understand and reduce energy consumption with a single meter, while producing the same breakdown as more expensive and complex competitor solutions. 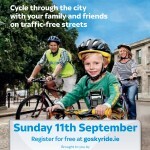 Sunday 11th September saw up to 10,000 people take to the streets of Dublin on two wheels for the first ever Sky Ride Dublin, making it the largest group cycling event that Ireland has ever seen! Lord Mayor of Dublin Andrew Montague officially opened the event, joined by An Taoiseach Enda Kenny, the Sky Ride Dublin ambassadors Nicky Byrne of Westlife and stylist Lisa Fitzpatrick, and Team Sky pro cyclist Russell Downing. 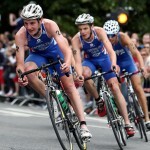 Ireland’s biggest triathlon, Waterways Ireland triAthlone, is expected to generate in excess of €12 million for the local economy in Athlone and surrounding area next weekend. Over 2,000 triathletes, amateurs and professionals, are expected take to the river Shannon and streets of Athlone for this year’s Waterways Ireland triAthlone which takes place next Saturday, 2nd July, 2011. The Irish Vocational Education Authority (IVEA) met with the Advisory Group to the Forum on Patronage and Pluralism in the Primary Sector earlier today to present their submission. 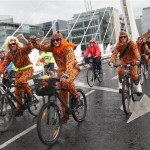 Despite the rain, over 1,250 cyclists working in and around Dublin joined Minister for Public & Commuter Transport Alan Kelly TD, to put their foot on the pedal for Dublin’s Bike to Work Day on Wednesday, 22 June. Gathering for the 1pm cycle in Grand Canal Square, the ‘thousand plus’ cyclists took a spin around the city to promote health, fitness, money saving and stress free travel. 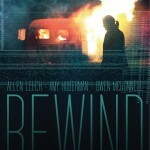 Rewind, the new Irish thriller starring Amy Huberman and Allen Leech will receive a cinema release in Ireland this Friday. The film was nominated for three IFTA (Irish Film and Television Academy Awards), including Best Director for PJ Dillon, Best Actress in a Lead Role for Amy Huberman, and Best Sound. Lead actress Amy Huberman scooped the prize for best actress for her role in the new Irish thriller.